Archbishop Paul Cremona and Imam Mohamed El Sadi face Mecca as they pray together at the Corradino Mosque, sending a message on the importance of dialogue among faiths. Photo: Matthew Mirabelli. 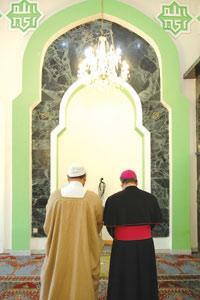 The importance of inter-religious dialogue was yesterday highlighted by Malta's Archbishop who prayed side by side with the Muslim Imam at the Corradino Mosque. Standing barefoot in the carpeted Mosque, Archbishop Paul Cremona and Imam Mohamed El Sadi faced Mecca when they immersed themselves in a few moments of silent prayer. "Dialogue between different religions is very important," Mgr Cremona said during the first official visit of a Catholic Archbishop to the Muslim place of worship and neighbouring Islamic Centre and Mariam al Batool School. On his arrival Mgr Cremona was greeted by the Imam, Islamic Centre director Wagdi Nashnosh, school principal Maria Camilleri, Libyan ambassador to Malta Saad El Shalmani as well as benefactors and staff members. After a brief stop at the Mosque, where Mgr Cremona was also shown the Koran, he visited the various classrooms where enthusiastic students of various ages greeted him with a choir-like "Good morning". The younger students sang nursery rhymes in English and Arabic to the Archbishop who reacted with his trademark beaming smile. He then visited the computer room where students delivered a presentation on different religions. Next, Mgr Cremona was shown into the school hall where a choir of boys and girls sang songs in English, Maltese and Arabic. One particular song aimed to tell the truth about Islam as students sang: "Islam is all about peace. Terrorism it doesn't teach". School principal Ms Camilleri explained how the school was set up 10 years ago after the Imam felt there was a need for a school that catered for Muslim students. The mixed school, that has about 180 students throughout kindergarten, primary and secondary school, teaches the Maltese curriculum with the exception that Islam is taught during religion class and students are also taught Arabic. She noted that the setting up of the school was a "unique project" as Catholic and Muslim teachers worked together with Muslim students and taught and exercised dialogue and respect towards the different religions. During a brief address Mgr Cremona thanked the children for their "beautiful songs" and said he was thankful for the opportunity to visit the centre. He pointed out that the harmony through which Catholic teachers and Muslims worked at the school "should be an example to the whole world" adding that dialogue between different religions was very important. Mr Nashnosh said that the Archbishop's visit emphasised the mutual genuine will of both sides to enhance and strengthen the relations between the followers of Islam and Christianity. "Today we confirm our will to strengthen the relations with the Catholic Church and to enhance dialogue and cooperation with it in different social and human spheres for the common good," he said. Just over a year ago, Pope Benedict XVI prayed at Istanbul's Blue Mosque in only the second papal visit in history to a Muslim place of worship, following in the footsteps of his predecessor John Paul II who made a stop at a mosque in Syria in 2001. Pope Benedict's visit followed outrage sparked by his remarks on violence and the teachings of the Prophet Muhammed, and was intended as a message of reconciliation to Muslims.